Last November, Johnson was the first of four sitting Council members to announce that he would not seek re-election this year. He then announced in January that he had accepted a job with the NHL for after he leaves the Council. 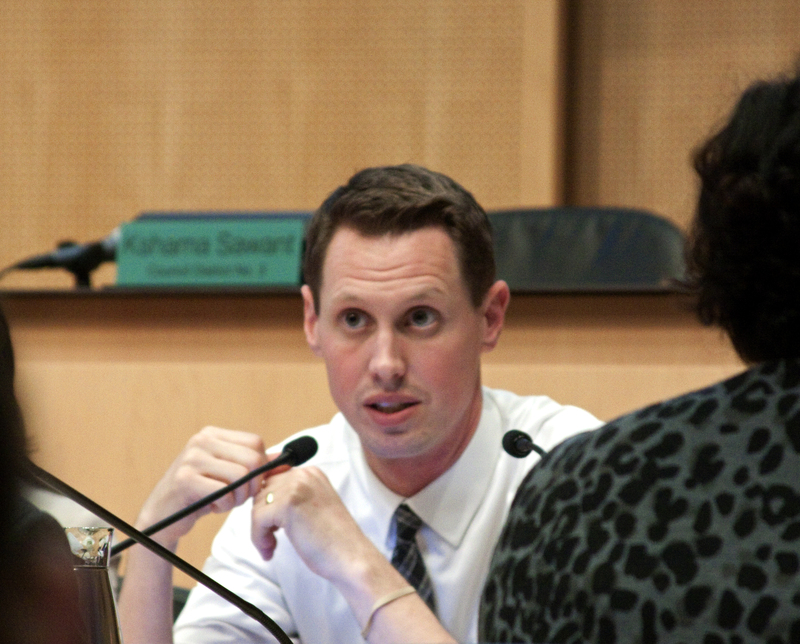 Earlier this month, District 4 candidate Alex Pedersen called on the Seattle Ethics and Elections Commission to propose changes to the city’s Ethics Code ordinance that would prohibit elected officials from accepting other jobs before leaving office (a problematic proposal that would leave officials unemployed for some period of time, a challenge for those like Johnson who have families to support). With the passage of Johnson’s signature legislative achievement, the city-wide MHA ordinance, on Monday, there has been speculation that he would resign before the end of his term. Erica Barnett noted that he had no legislative work scheduled past April, though he denied in February that he would leave early. reopening and expanding availability of the city parks’ wading pools during summer months. The City Council must now appoint someone to fill Johnson’s seat until the general election in November, as it did when it appointed John Okamoto to replace Sally Clark in 2015 and Kirsten Harris-Talley to replace Tim Burgess in 2017. It’s complicated, however, by the fact that it’s an election year and nine of the people who might otherwise be appointed to represent District 4 are currently running for the seat. In the past, the Council explicitly looked to avoid influencing the election by appointing someone who wasn’t running for office, and Council President Bruce Harrell has expressed his preference for doing so again. As stated in Article IV and Article XIX of the Charter, applicants shall “possess the qualifications required for election to such office” and “a district member shall be a resident of the district represented for at least one hundred twenty (120) days.” It would also be practical to seek a new Councilmember that would be qualified to chair the Planning, Land Use and Zoning committee vacated by Councilmember Johnson. Given the need for our new Councilmember to “hit the ground running” and this fall’s election seven months away, I believe we should appoint an experienced “caretaker” who agrees not to seek election to the Council this year. In addition to taking over the responsibilities of Councilmember Johnson’s standing committee, participation and assignment to King County Committees, Regional Committees, State Committees, and City of Seattle Committees, the new Councilmember will be handling multiple issues in the Council’s 2019 Work Program related to affordable housing, homelessness, transportation, library levy, the confirmation of City department leaders, and then our annual budget deliberations in the fall. Candidates for appointment should demonstrate an understanding of Seattle City government operations, budgeting, and legislative processes; demonstrate knowledge of the public policy issues associated with potential committee assignments; demonstrate a commitment to social justice and the ability to communicate and collaborate effectively across cultures and with diverse populations; and, desire to serve the people of Seattle as a public official and assume the responsibilities and accountability inherent in the work of a Councilmember. Needless to say, the list of people who live in District 4, are experts in land use and zoning issues, and meet the rest of the qualifications for serving on the City Council is likely to be extremely short. Even with the main MHA legislation done, Johnson’s PLUZ committee will have a busy 2019, including a long list of one-off upzone requests that didn’t make the cut for the MHA ordinance; the MHA upzone of “the Ave” in the University District, and Johnson’s stalled attempt to pass an update to the city’s tree-canopy protection ordinance. Applications will be accepted from March 25 through April 5th. On April 9, the City Clerk will deliver to each of the eight other Council members a notebook containing all of the applications, and post the applications on the Council’s and City Clerk’s web sites. The Council will meet in April 11 at 1:00pm, in closed “executive session,” in order to discuss qualifications. This is allowed under the state Open Public Meetings Act. On April 15, the Council will select a short list of finalists. In a special Council meeting on April 17 at 5:30pm, the Council will hear 3-minute presentations from the finalists, ask them questions, and hear public comment. Sometime between April 10 and April 19, the Council will convene a public forum for interviewing the finalists. Community entities may make submissions on how they would like to “inform the forum structure, questions, and accessibility considerations.” The public forum requirement came out of activists’ demands for such a forum when the Council was choosing a replacement for Burgess in 2017. The Council will vote to fill the vacancy on April 22 at its regular weekly meeting. According to the City Charter, the Council has twenty days to fill a vacancy from the point it becomes vacant, which sets the deadline at April 25. If the Council has not filled the vacancy by then, it is required to convene every business day after the 25th to hold a vote until the vacancy is filled. Thanks for explaining what to expect as this interim appointment goes forward. So many opinions about him applying for a job while he was still on the council and with an company that has business in front of the council. True. But to be clear, Johnson worked with the Seattle Ethics and Elections Commission when he accepted the NHL job to define a policy wherein he would recuse himself on any matter coming before the Council that related to his future employer, and the NHL and OVG’s renovation of Key Arena. That doesn’t mean it shouldn’t still raise eyebrows, but he did try to do the right thing. As I alluded to in my post, this is going to be a perennial issue; we can’t expect elected officials to be unemployed immediately after leaving office, since they still have bills to pay. Johnson landed a new job very early, which is weird, but the fact that he was job-hunting before he left office is to be expected. You make valid points, however, if he only worked with the SEEC after he accepted the job makes one wonder what was the process when he was interviewing and looking for a job. But we had this happen with Sally Clark, moving the UW while she was still an council member. Be careful filling in the blanks. When to announced that he had accepted the job, he also announced that he had worked out an arrangement with the SEEC. We don’t know the exact sequence of events as to when he started working with the SEEC and when he was negotiating/accepting the job offer. Lack of transparency leads to folks having to fill in the blanks. And while I might have made conclusions, I still think it is valid to question.